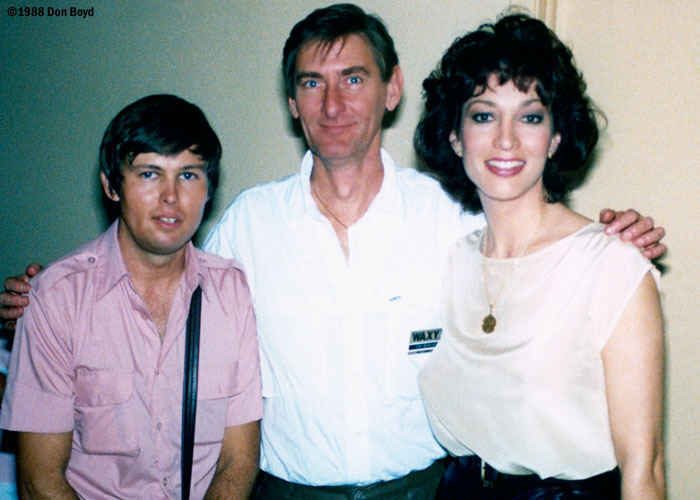 Ronnie from Ronnie's Records in Homestead, Jim Dunlap (passed away in 1999 in the Atlanta area) and his beautiful stunning wife Lynne Russell, then nightly anchorwoman on CNN Headline News which I watched every night. Jim Dunlap was a very popular disc jockey, Music Director and Program Director at WQAM "Tiger Radio", 560AM, in Miami in the 60's. WQAM had close to a 60% market share of radio listeners at their peak, several years before FM radio became more available. That type of market share is unheard of these days. Jim passed away in the Atlanta area on September 28, 1999, after a prolonged illness. This photo was taken at a public reunion of WQAM disc jockeys at Biscayne Baby in Coconut Grove, hosted by radio legend Rick Shaw of WAXY-FM (now with WMJX Magic 102.7) and former disc jockey at WCKR, 610AM, and then WQAM for many years starting in the early 60's. Jim Dunlap moved up to Atlanta and became a Paramedic. He passed away in the mid to late 1990's. He was a real gentleman with a strong love of people.